It is difficult to dispute the prominence of keyboarding as a foundational skill needed in today's technology-rich society. My personal favorite for online keyboarding is Typing Pal. For a free program, typing.com is a good alternative. While there is a plethora of great keyboarding software out there to buy, there are times when you’d just like to go online for some quick and easy practice. Below are some great sites that will get your fingers flying across the home-row in no time. Dance Mat Typing, from the BBC, is a great program for beginning typers. There are different levels that focus on specific keys and after each successful level, students are rewarded with a song and dance. Quick, basic, and easy to use. Keybr tracks your speed, errors, and keys that you are struggling with. Another nice feature about Keybr is that you can type the content from any website by simply entering the url of that site. PowerTyping is a free online typing tutor for Qwerty – US standard 101 keyboard and Dvorak keyboard. There are typing games, tests, stories, and more! 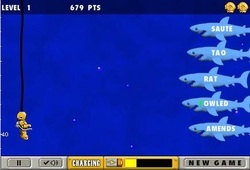 Great graphics, a map, killer sharks attacking you. What’s not to like about Typershark? 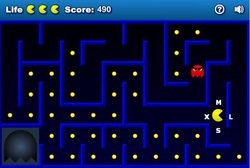 You can play it free online, or download a free version to unlock all of the levels. The free deluxe version allows you to play 60 minutes of game time. After that, you can either go back to the free online version, or pay $6.99usd for complete ownership of the full version. 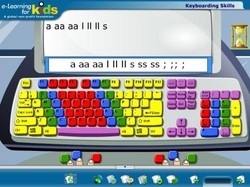 Fun to Type is a game-based keyboarding site that is high interest and allows students to practice individual letters. While not a strong tutorial program, it would be a fun place to stop by for a break. Sense-Lang has a nice tutorial interface with an interactive keyboard that highlights the keys you missed. WPM and accuracy are calculated as you type. There are also some fun and entertaining games. Typing Master is a site to go to for 3 great games, including, my favorite, KeyMan Typing. There is also a great 1-3 minute typing test that I give to my students throughout the year for a quick analysis of their current keyboarding skills. 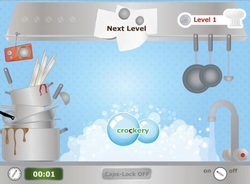 Typing Chef is a fun game from Sense-Lang where students type what they see in the kitchen. You start out as a dish washer, then move up to vegetable chopper, on your way to head chef. Great Italian restaurant music plays while you type and the chef gives a not so subtle, “Ahem” when you make a mistake. While not a full-fledged typing game per se (you only practice 7 keys), there is no doubt that UpBeat is the favorite typing game of many students. It’s a bit like guitar hero in that you chose a song and then type the letters at the appropriate time. Typing Web is an online typing tutorial that provides instant feedback after every free typing lesson. Typing Web offers beginner through advanced typing lessons for free. You can register to track your progress or you can use Typing Web without registering. Word Games offers a large collection of online word games and typing games. The word games range from simple word searches and crosswords to games that require players to complete sentences and phrases. The typing games are a mix of simple sentence typing for speed and games that require accuracy to "defend" a character or move a character through a scene. 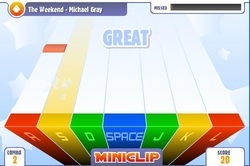 Some of the games featured on Word Games can be either downloaded to your computer, see Typing Defense, others can be embedded into your blog or website. Listen and Write is a great way for students to improve their typing skills and hear about the news. Listen and Write plays short audio clips of news stories and users type what they hear. The audio clips are relatively short, come in a few different levels, and registered users can track their progress. Power Typing hosts a small collection of five typing games that students can use to develop their typing skills. Power Typing also offers typing lessons for Qwerty and Dvorak keyboards. The two games that I found easiest to access are Alphabetic Rain and See Don't. Dance Mat Typing is a nice little resource from the BBC. Young students (four to eight years old) can receive clear, informative typing instruction through Dance Mat Typing. There are four levels for students to work through. Within each level there are multiple lessons and practice activities. The very first lesson that students receive is placement of their hands on the keyboard. Each lesson and practice activity offers instant feedback in visual and audio form. Bonus Just for Fun Item! I Do Dog Tricks is a fun little typing activity from Heart Gard. Simply type a command and the dog in the picture will do the trick that you type. Try "bark" and "roll over" to get started. FreeTypingGame.com has numerous fun typing games. Game Aquarium has numerous games as well as courses to teach keyboarding.